Manifesting Reloaded Master Class ~ 3D multi-dimensional manifesting. 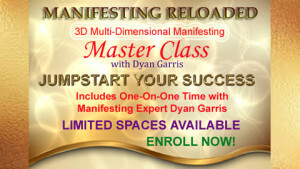 I am now accepting a limited amount of new students into the “Manifesting Reloaded” Master Class. Manifesting Reloaded is a game changer, a life altering master class where you will learn how to create your life exactly the way you want it to be. You can succeed at anything! Manifesting anything – including money – is very simple and easy once you understand what’s in your way and exactly how to unblock it at the root. You’ve just been missing some very important fundamentals and important missing links to the manifesting equation. I’ve helped thousands achieve success and move forward. I’ve helped thousands of people just like you, with how to live their best lives and how to create their lives from who they really are and what they came to do. In Manifesting Reloaded, you will learn step by step how to create your life exactly as you’d like it to be. You will learn to take everything, the ingredients in your unique “refrigerator” of life, and DO something with it all. You will learn to make something amazing with it all. The course includes personal one-on-one time with me as well. You can schedule your first call with me right after you finish module 1. Full course details and enrollment here. For those not familiar with Dyan Garris – Dyan has spent her lifetime using her special gifts to help others, and the goal is to teach you how to put it all together. ~ A. A. R.
“Ms. Garris explains in concrete terms what one needs to understand and do as well as why people who are doing affirmations, visualization techniques, and meditating, which are all good things, may not be succeeding in achieving their goals and what they also need to do and best of all, how to do it .” ~Denise Bridgen. Remember, I can only accept a limited amount of students in this master class. I expect the course to fill up early, so now is the time to enroll.